I thought they "needed" it! And it did make them better! Three fits very well on a saucer! Combine butter, sugar and almond extract in medium bowl. Beat at medium speed, scraping bowl often, until creamy. Knead mixture 4-5 times in bowl until dough forms a ball. dough from pan. 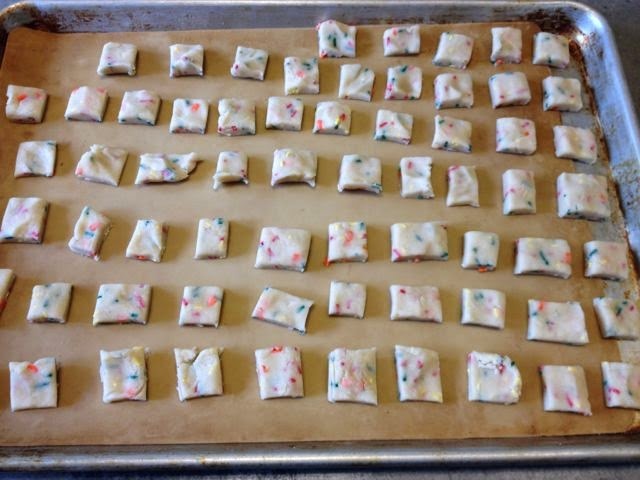 Cut dough into 1/2-inch squares. bottoms just begin to brown. I mixed powdered sugar and milk together to make a glaze. As an afterthought, I should have added a little almond flavoring as well. NOTE: I used Halloween nonpareils. It's Tuesday and I'm sharing my tea this afternoon with Sandi at Rose Chintz Cottage for Tea Time Tuesday and Bernideen for Friends Sharing Tea. Those a darling! And truly "bite sized"! So glad you shared! A very cute recipe, and the finished product looks great! These look good..not heavy on sugar either. But what is AP flour? 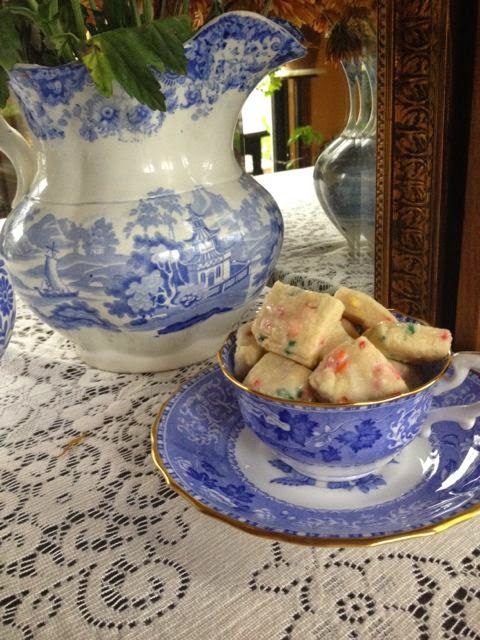 Yum, I just love shortbread with tea....and to sip tea from that beautiful china, WOW! Your Fairy Bites are adorable and I bet they melt in your mouth. I have a similar recipe. I love that three of them fit nicely on the edge of your saucer. Your Spode Camilla is gorgeous trimmed in gold. Thank you for joining me for tea and enjoy your day. Such a beautiful table you set. I love your Spode! I have never heard of Fairy Bites, but they look wonderful! I will have to give them a go. Thanks for sharing the recipe. Good morning Martha....I just love the table setting. It looks so cozy and inviting....as always ! I wish I lived near you just to share one afternoon tea with you ! 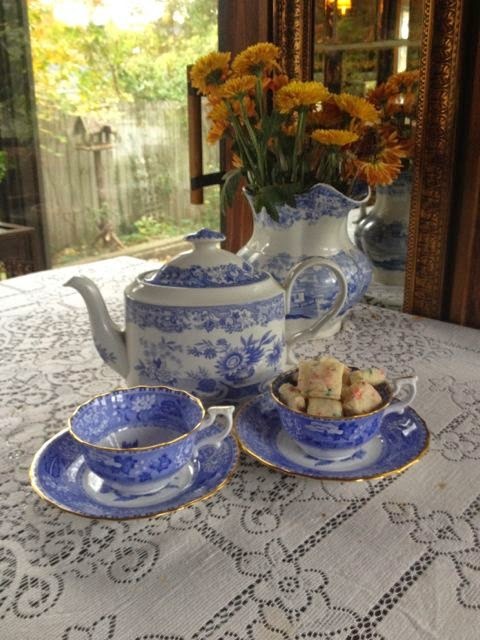 I do so love blue and white china! Those fairy bits look great.. just enough. They are so sweet looking and a size that is guilt free. I want to try these. Your blue and white is simply gorgeous. Ah, yes, I don't know what AP flour is either. Everything looks sweet and inviting. I think those fairy bites would disappear way to quickly around me! What beautiful cups. A cookies are perfect for tea. Fairy Bites. . .divinely delicious!!! 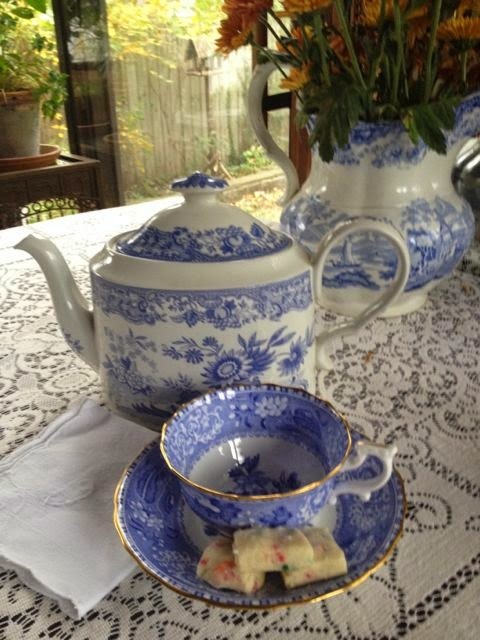 Love your blue & white tea cups and saucers!! !